The bad behaviors and the adventures of the most important hacker in the world during the 6 years of asylum in the Embassy of Ecuador in London. 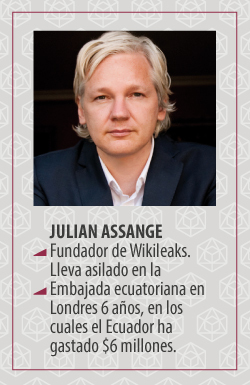 What has the leader of the information revolution done during the last 6 years, locked up in the embassy of Ecuador in London? “I must admit that I would have gone crazy,” said a colleague as we tried to get an idea of ​​the level of paranoia, stress and pressure that our new compatriot Julian Assange must suffer, that with his information has made the world tremble. Six years of living a minimum space of about 60 square metersthat has divided into two, one part to sleep and another that uses as an office. 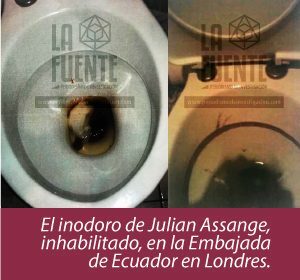 It is worth remembering that the space in which Assange now lives, did not even have a shower, or a bathroom for his personal use and the embassy had to invest hundreds of thousands of dollars in special expenses for the adaptation of the small guest suite between other expenses. 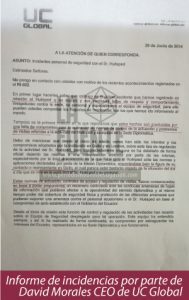 Since the end of 2017, Assange is Ecuadorian , has a certificate, a diplomatic passport and is domiciled in the Chaupicruz neighborhood of Quito. Despite having lived for six years in the embassy of this “insignificant” country, as he described Ecuador one day , of being surrounded by Ecuadorian diplomatic personnel and Spanish agents of UC Global, he does not speak a single word of Spanish, he did not even learn to say Thank you, although he presented his asylum request in perfect Spanish in June 2012 and even some Ecuadorianisms. In the bitter freedom of his room , Assange has some implements of the geeks of technology. An iMac computer, in which he spends most of the day, the electronic shackle that brought him justice, voice distorters, his own internet and a free SAMSUNG S3 phone . The photographs of the UC Global reports allow us to approach the situation of the hacker during these 6 years of asylum. Almost every day, for half an hour, he uses the treadmill he has in his room, and trained boxing with a former British special forces officer. He uses a spray for his whole body, a dry bath, since some health problem would prevent him from taking showers regularly. 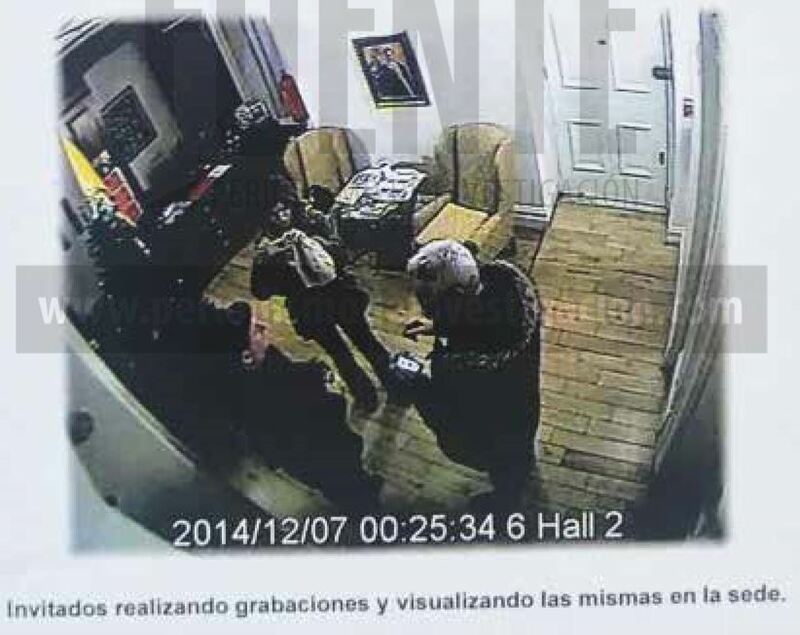 Why Ecuador invests more than USD 6 million in security, espionage and counterintelligence operations of this guest, who apparently is very uncomfortable in the Ecuadorian embassy? You really fall short of imagining how these power games work. But we will make an effort to tell you a story that, more than demonizing the hacker, seeks to show the consequences of the cunning of Rafael Correa by placing us in the uncomfortable situation of assassinating Assange . Julian Assange , a powerful guest. Rebellious by nature, full of transcendental information for a politically, ethically and economically corrupt system;founder of Wikileaks, who while trying to escape the interests of the United States, was forced to seek asylum in the Ecuadorian embassy in London, knowing or not knowing that he would now play for the Russian and Chinese empire, allies of former President Rafael Correa, now fugitive in Belgium. 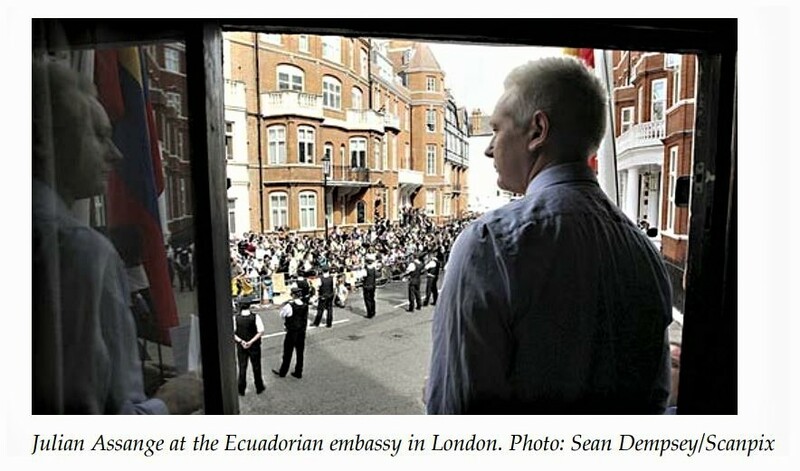 Since June 2012, the leader of Wikileaks is isolated in a room of the Embassy of Ecuador in London and apparently has not been comfortable for a long time. By September of that same year, there were already reports of the bad behavior of the Guest. 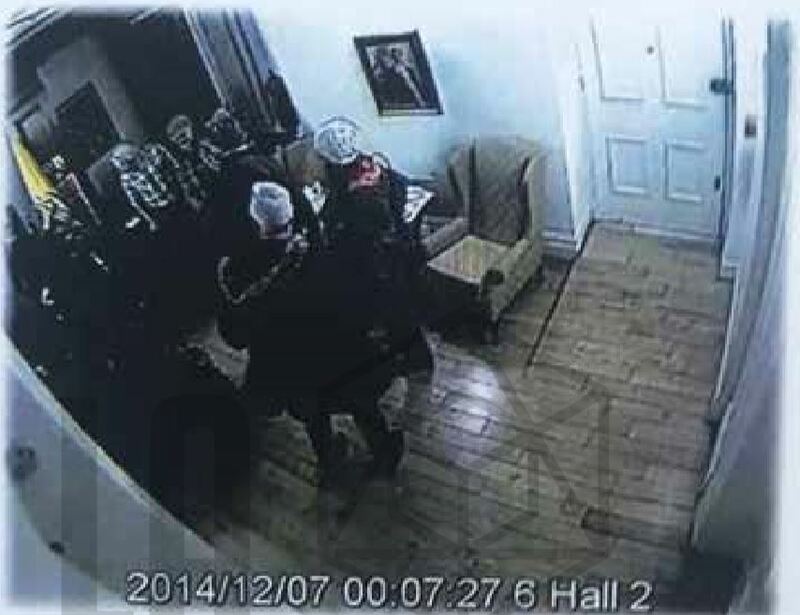 In the regular reports prepared by the guards of UC Global, on the INCIDENTS of the guest at the embassy you can find photographs and really alarming reports about the current state of Assange and its relationship with the embassy. Apparently nobody is supported anymore. 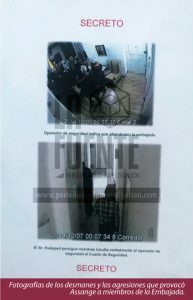 In the report of September 6, 2012 it is reported that “the guest breaking the rules exposed by the security protocol previously agreed between the embassy and his team, access the access control room to manipulate and view the images of the surveillance video , the agent lets him know and he makes threatening and contemptuous gestures while manipulating the recording system, Mr. Huésped gets up from the seat and punches the recorder’s monitor, leaving it unusable “. Likewise, the report reads that the next day there is a meeting with members of the embassy and consulate to publicize the facts and see how to change that situation , but really the coexistence in the embassy did not improve, nor has it improved with the passage of the weather. Stella Morris, who would be her partner, has been labeled as a provocateur by the UC Gobal company, which has encounters with her every day. For some months Stella has arrived at the embassy in the company of a small child, according to our sources. 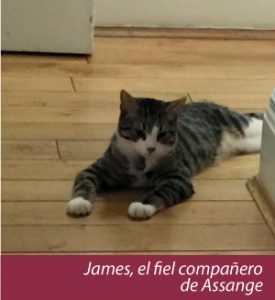 In a report dated May 15, 2014, it is reported that a conflict has been generated since one of the guards he warns that in Assange’s room the tap has been open for too long and the water is running. The guard comes to ask them to close it to what Stella responds to abusively, threatens him, tells him that he will lose his job. The report also states that Assange’s mental health would be compromised since the guest leaves the lights on and the taps open so that their conversations are not heard and can not be located from the outside. 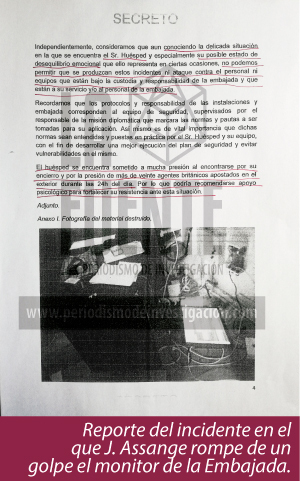 The Spanish company UC Global has reported dozens of complaints of violence, mistreatment, hanging, dislocations and total disrespect for the basic rules of coexistence by Assange towards the personnel of the Embassy, ​​we have also seen the reports that Ambassador Juan Falconí directed to Ricardo Patiño , without results; It seems that nobody can do anything to control the guest. 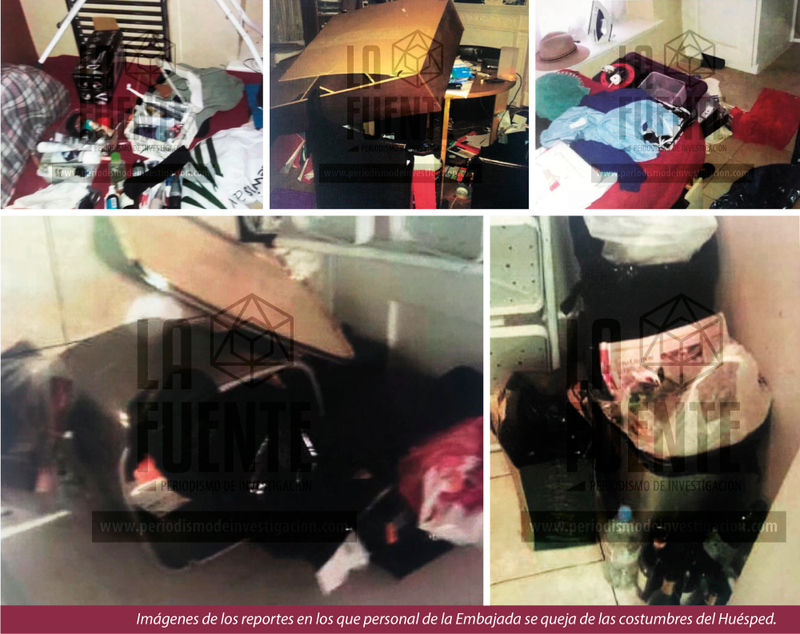 Surely the scene of Julian Assange playing soccer in the Embassy room, knocking things down and hitting walls, is paradise for some rebels, however it is not so funny when each of the Ecuadorians, we end up paying these autogoles del correato. In the reports, UC Global complains that none of the authorities that know about this issue has been present or responsible for these acts . And it is that Assange apparently feels that he has the pan by the handle (pan that has not washed long ago also). He makes and undoes in the embassy, ​​disorder and arbitrariness stains Assange’s stay, his friends come to visit him, they celebrate dinners and they make toasts, they also work and spy a bit so as not to lose the habit. 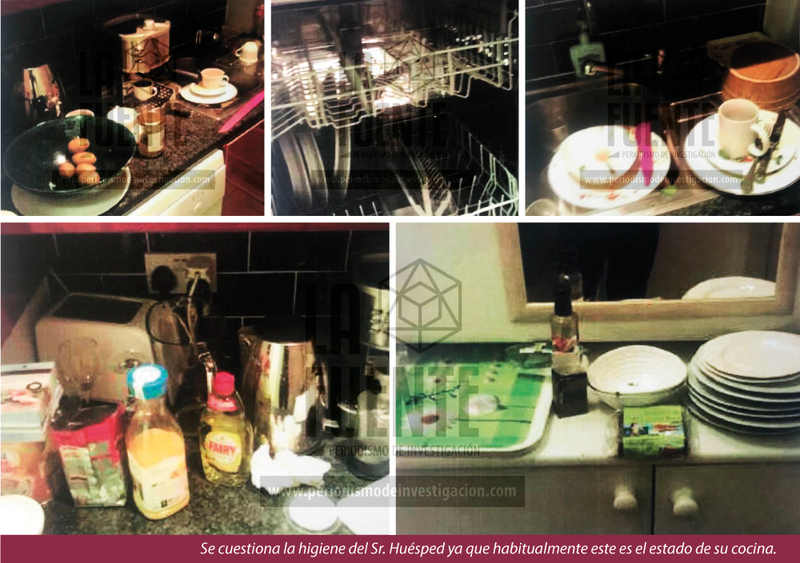 The hygiene of our Guest is continually questioned, who does not care about the state in which his house is located, as it is shown in these exclusive photographs. Among the more than 50 reports that this medium had access to, one of the most alarming incidents occurred on June 28, 2014 and with the issue of reporting the manipulation and final destruction of the disturbing sound system of the meeting room. the Embassy, ​​UC Global makes a report confirming that SOMEONE , who surely knows about technology, would have “cut and manipulated the connection of the device that prevents eavesdropping in the embassy meeting room” , here it is identified that In addition to cutting the cable with a specific tool, the fake was made with cellophane paper, as seen in the photographs. Still, no authority has taken action on this. Stella and other friends of Assange would be committed to their task of being obnoxious guests, they enter and leave without due process, they introduce alcoholic beverages, they record inside the embassy, all this before the frown of the agents who feel that the guest does not he has no respect for his work, which has hit, shaken, hanged and insulted the UC Global staff alleging that he has information that totally invalidates the Ambassador and that he (the guest) will do what he wants. So says the report sent by David Morales CEO of the company UC Global . Another one of the adventures of Julian in the embassy takes place the night of the 28 of June of 2014. in which recording a supposed interview for the Danish television a great feast is realized in the meeting room of the embassy, ​​without permission some by his Market Stall. Around 01h00 he decides to lean out a window to film the exterior of the Embassy, ​​the duty guard proceeds to stop to the guest and ask him to desist from his objectives. Then he goes to his room which he comes back with with a megaphone that uses in alarm mode to provoke the British police who are guarding the Embassy, ​​waiting for the minimum movement of Assange. 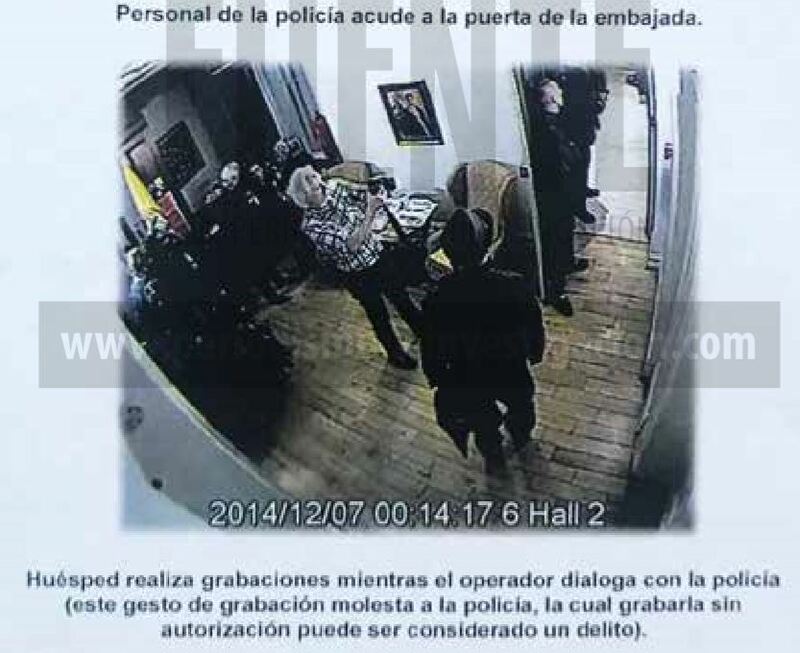 Like this, many incidents with Assange and his friends have been presented at the Embassy, ​​however one of the strangest would be this video in which Vicente Miño, SENAIN agent assigned to the embassy, ​​receives in the vicinity of the diplomatic headquarters , very strange packages from the hands of a man totally covered and unrecognizable, questioning any security protocol of the Ecuadorian Embassy . Then the exclusive video for THE SOURCE . Although the cosmic trampling on Ecuadorian sovereignty is also worrisome, we can not help but wonder about the mental health of the information capo.In another of the sadly written, UC Global reports (sad about the amount of spelling and syntax errors) we see dirty laundry thrown away, unwashed dishes for several days, an “almost unusable” toilet, as the report kindly says, that would show that our rebellious guest would not be having a great time. After 6 years in the Ecuadorian embassy in London, with all the persecution that Julian Assange is going through, Ecuador has spent more than 6 million dollars from SENAIN to deal with this hacker, who got his stay thanks to the silence. 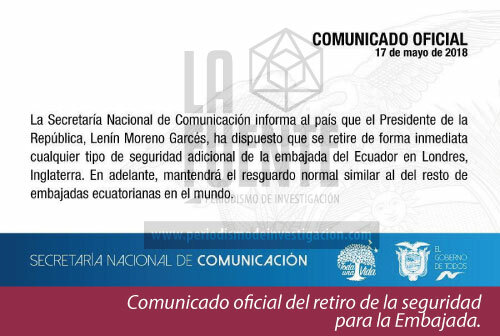 In May 2018, after denouncing the expenses that Assange’s asylum would be generating, President Moreno ordered the suspension of any extra security that the Embassy of Ecuador had in London. 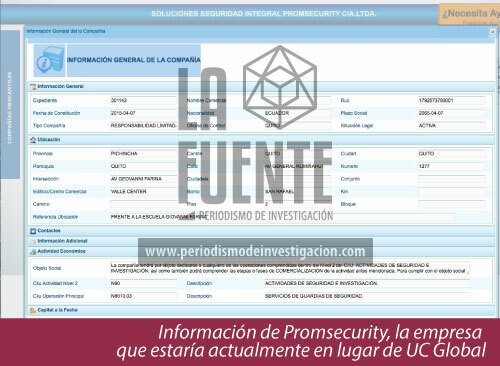 However, our environment knew that the company with which the contract was maintained since 2012 was simply changed, and instead of UC Global, the company Promsecurity is now in charge , which according to the Superintendence of Companies is also dedicated to the protection service. and guardianship. 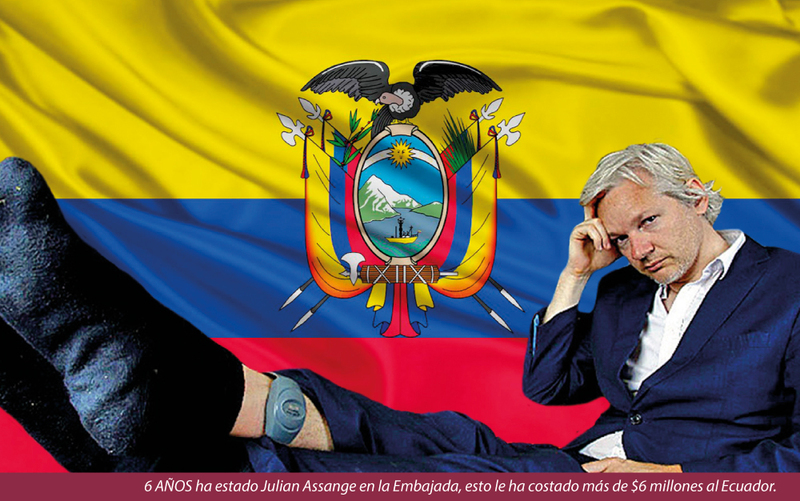 Now we talk about a strategy for Julian’s departure from our embassy, ​​and while we can emphasize that it was time, we will ask again who is going to pay for Assange’s balonazos against the Ecuadorian sovereignty?